Teeth Whitening, What You Should Know! Having teeth that are stained or discolored can have a big impact on the way you feel about your appearance, especially when you smile or talk to other people. This can end up affecting many areas of your life, including work and interpersonal relationships. Teeth whitening can help you improve your smile and boost your self-confidence. Keep the following information in mind, so you can determine if this might be the right option for you. In order to choose a teeth whitening option that works best for you, it’s important to understand why your teeth are stained or discolored. Teeth can develop stains or discolorations from tea, coffee, red wine and other acidic beverages that make your tooth enamel weaker. Smoking or using other tobacco products can also stain or discolor your teeth. Other common causes of tooth stains include certain kinds of antibiotics and injuries that damage your teeth. You might also develop discolored teeth as you get older. This occurs as your tooth enamel erodes over time, making the yellowish interior of your tooth more visible. Keep in mind that some teeth whitening treatments are not as effective for certain types of stains or discolorations. Teeth whitening options include over-the-counter products that you can get at local drugstores and professional treatments. Over-the-counter products, such as teeth whitening strips and toothpastes, provide a convenient way to make your teeth whiter. However, these products contain bleaching agents that are not as effective as professional teeth whitening products. Professional teeth whitening options include in-office treatments and take-home treatments. In-office treatments involve applying a whitening agent to your teeth, while take-home treatments involve using kits that contain a whitening tray and bleaching agent at home. In-office treatments typically offer the most effective teeth whitening option, although take-home kits can be more convenient. Not everyone with stained or discolored teeth is a suitable candidate for teeth whitening treatments. Whitening usually works more effectively on mild stains and discolorations, but it might not work at all if your teeth have been discolored from antibiotic use. 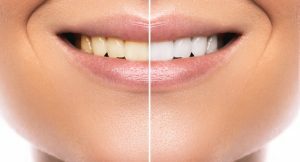 In general, teeth whitening tends to be more effective at breaking up stains and discolorations that are a yellowish or brownish color rather than a grayish color. More severe stains and discolorations usually respond better to professional treatments done in the office instead of take-home kits or over-the-counter products. You should also be aware that teeth whitening products are not intended for changing the color of cosmetic treatments, such as veneers, or crowns and other artificial teeth. If you need more information on teeth whitening to improve your smile or if you’re wondering if you are a good candidate for it, please contact Keith L. Schwartz, DMD. Dr. Schwartz offers quality dental care in Coconut Creek, Florida, including teeth whitening and other cosmetic treatments.